So so busy with parties and cakes I never have a minute to post any photos! Last week I made a little doll not for any of the parties but because my sister phoned me at 8pm "Do you have a doll I can have that will fit in a little bed?" I started looking through Eliza's toys frantically searching for a little doll..."No not a used one" she says. Well no I don't have a stash of unused dollies lying around my house...my present drawer(s)/cupboard/spewing out of every available space/are good but they are not that good. Actually I did have two dolls but they were not the right size :o Haha. 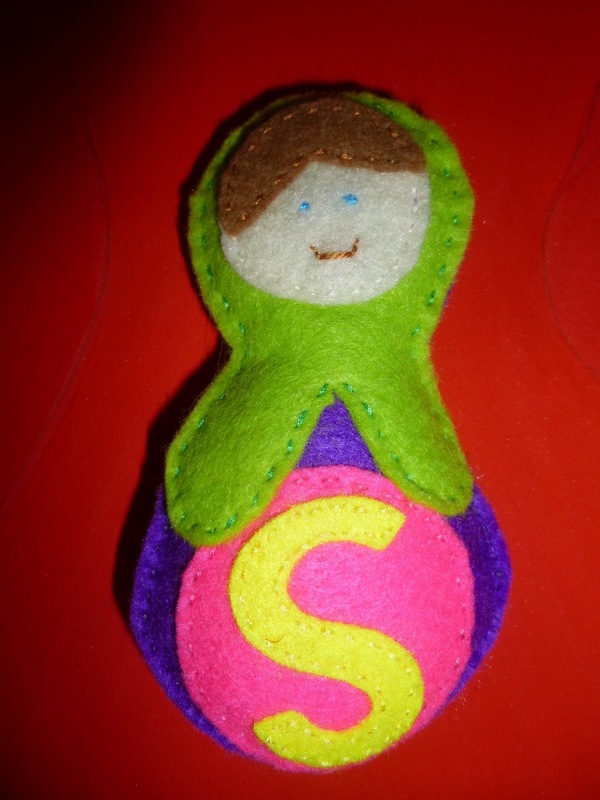 I was then on a mission to sew up a little mouse from a kit I have lying around but I quickly searched my beloved pinterest for inspiration and came up with a little felt Babushka doll. I didn't follow a pattern I just cut as usual. But very similar to this pin which I think might have a template. I had felt letters from a previous project so I sewed an "S" (the little birthday girl's initial) onto a pink circle then sewed the pink circle onto the purple number 8-ish shape. I then made a little face with hair and sewed this onto a green circle with scarf shape. I sewed the green scarf section down onto the purple number 8 shape. I then sewed a purple backing number 8-ish shape, leaving a gap to add some stuffing, before sewing closed. Very simple and took about an hour and a half. It is the perfect size for a little one year old. This is the little bed Uncle Grant (of lego board fame) made including a little sewn sheet (my sister) and a knitted blanket and pillow (Granny Norma of Abnormal Knits!). Soooo cute! And here's little "S" sleeping in her new bed.